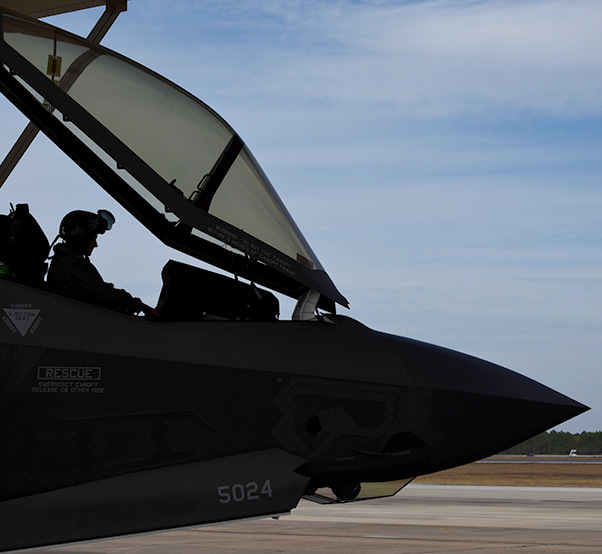 An F-35A Lightning II taxis before takeoff to participate in simulated defensive counter air operations Dec. 8, 2016, at Tyndall Air Force Base, Fla. 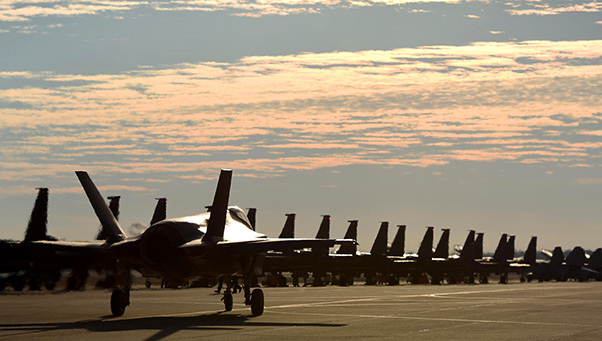 The 33rd Fighter Wing deployed six F-35A Lightning II and 95 personnel to Checkered Flag 17-1. Checkered Flag is a combat rehearsal where 15 aircraft platforms take to the skies to fly realistic and large-scale operations to prepare for contingency operations. 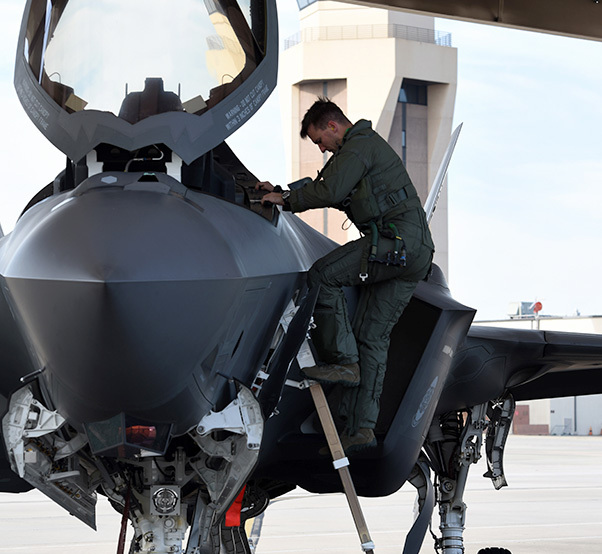 Specifically, this exercise tested the range of capabilities for the F-35A and the 33rd FW student and instructor pilots, maintainers, air battle managers and intelligence officers by operating from two locations. 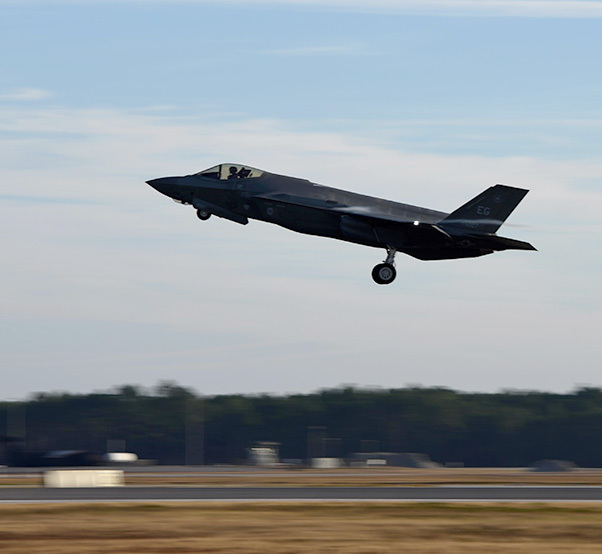 The Eglin Air Force Base’s 33rd Fighter Wing deployed six F-35A Lightning II and 95 personnel to Checkered Flag 17-1 at Tyndall AFB, Fla., Dec. 5- 19. Checkered Flag affords fifth and fourth generation enterprises the opportunity to integrate with each other during realistic and large-scale operations. The largest change between Checkered Flag and other exercises for the 33 FW is the cross-pollination of information that takes place between platforms. 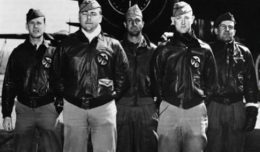 Previously, pilots and mission planners from the 33rd FW were physically separated from other exercise players. With Airmen on station at Tyndall AFB that gap is closed and pilots, air battle managers and intelligence personnel can debrief their lessons learned together, which is critical to the development of F-35 integration tactics. While being able to integrate the aircraft and personnel was a major goal of the 33rd FW, there are several other key takeaways from the exercise. 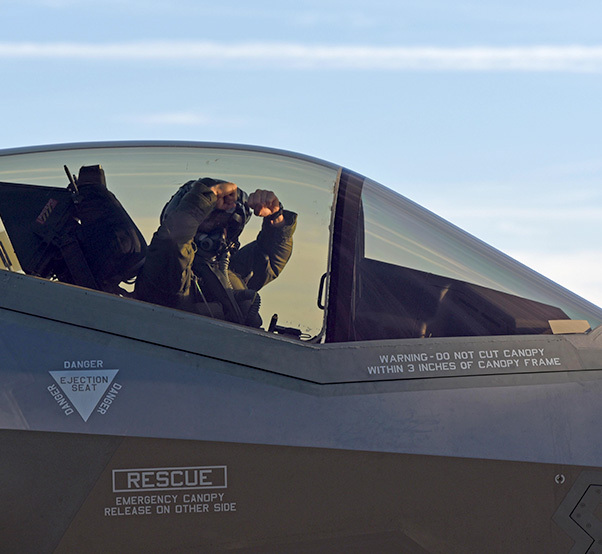 Lt. Col. Jon Snyder, 58th Fighter Squadron director of operations, sits in the cockpit of an F-35A Lightning II before takeoff Dec. 8, 2016, at Tyndall Air Force Base, Fla.
Checkered Flag 17-1 marked the wing’s largest split operations for the F-35A. As the deployed units launched sorties from Tyndall AFB, additional aircraft launched from Eglin AFB to act as aggressors. Executing split operations requires an organization to deploy a small contingency that can sustain itself from a separate location while maintaining operations at home station. A pilot from the 58th Fighter Squadron shows pride for the Squadron’s mascot, the Gorillas, before taking off to “fight” in exercise Checkered Flag Dec. 8, 2016, at Tyndall Air Force Base, Fla. The 58th FS took full advantage of the diverse training opportunities that Checkered Flag presented. F-35A student pilots flew production flying training sorties to compliment traditional coursework while immersed in real-world operations. An F-35A Lightning II takes off to practice combat sorties with over 60 other aircraft in exercise Checkered Flag Dec. 8, 2016, at Tyndall Air Force Base, Fla.
Maj. Brad Zimmerman, 33rd Operations Support Squadron assistant chief of weapons, exits the cockpit of an F-35A Lightning II after a combat training sortie in exercise Checkered Flag Dec. 8, 2016, at Tyndall Air Force Base, Fla.